For two years, from the end of October 2001 until October 2003, I spent my life in and around Berlin, Germany. I was there as a missionary for The Church of Jesus Christ of Latter-Day Saints. When I was 19 years old, I decided to serve God by being his servant and teaching people about him and his plan. I spent two months in Provo, Utah to learn the German language and other skills. Then, I went to Berlin and started the proselyting portion. I spent all my time talking to people and teaching them about God and his message to them. This was challenging due to the fact that many people in the former East Germany are atheist. However, it was a wonderful experience and I learned a lot about life and my faith. The area that I originally went to was the northeastern part of Germany. 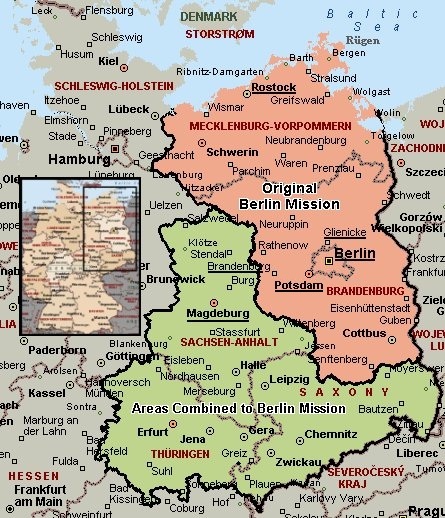 Three months before I returned home, the Leipzig Mission was combined to the Berlin mission. I was able to see a lot of neat places as well. We had time one day a week to take care of personal business and do some sightseeing. I really enjoyed this because I like history. There is so much history in Germany. My first city was Rostock, on coast of the Baltic Sea. After four and a half months there, I went to the Mitte in central Berlin. I stayed there for four and a half months before going to Lankwitz in Berlin. I was then sent to Brandenburg an der Havel for three months. After my time in Brandenburg, I went to a small town north of Berlin, called Glienicke/Nordbahn. I stayed there for six weeks before moving to Tiergarten in Berlin for four and a half months. I then went to Marzahn in East Berlin. After staying there a short time, I went to my last city, Magdeburg. Consequently, Magdeburg is the sister city of Nashville, TN. The map above shows where I was. The underlined cities are places that I lived in or proselyted. Click the underlined cities to see pictures of where I have been.